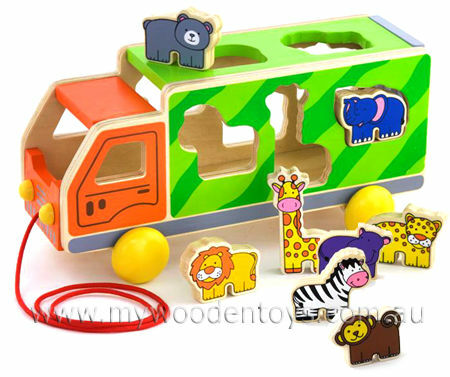 Pull Along Animal Shape Sorter is a beautifully colourful wooden pull a long truck with holes cut into the sides to fit eight wild animals. This multi purpose toy provides many opportunities for play and you have to fit the right animal in the right hole to safely get the animals inside before you drive off. When you get to where you are going you can then lower the ramp at the back and let the animals free. This truck is very well made, perfect for eighteen months plus and a great encouragement for your little one to walk and trail the truck behind them. Material: Wood, Child-safe paint, metal axle. We like this because: "So lovely and bright."